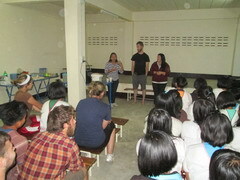 On December 11, 2012, Mr. Michael from YWAM Bangkok contacted us and informed us that WYAM Madison Discipleship Training School (DTS) would like to visit, encourage, and help the two hostel ministries in Omkoi. 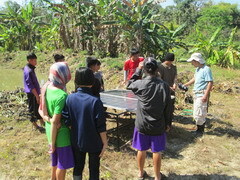 The total number of the team members is 17 persons. 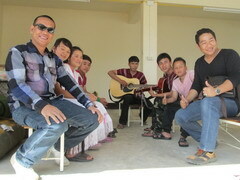 We have never met or known these brothers and sisters in Christ. 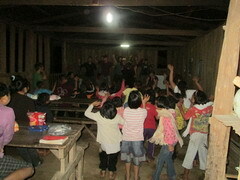 I always tell the children that God’s network is unlimited. 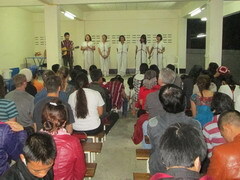 Although they came from the other side of the world and we are from a peak on the mountain, nothing can stop the love of God from uniting us. 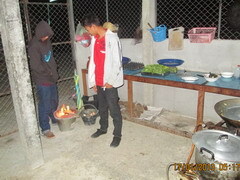 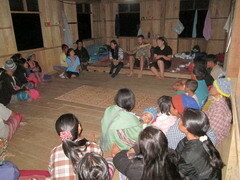 Five am is the time that students at the Metal Drum Student Home (Coffee Hostel) get up and take turns cook according to each group agreed upon schedule. 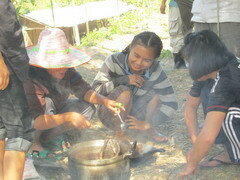 The temperature this early morning at Omkoi is 10 degrees Celsius because the altitude is about 1000 meters above sea level and the Mae Tuen River runs close by. 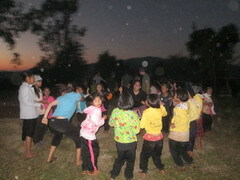 Whereas, in Chiang Mai, the altitude is about 300 meters above sea level, with a more moderate temperature. 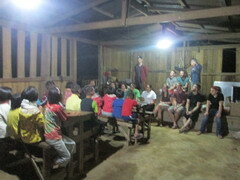 Yesterday Kevin and I talked together about what the team should work on for the next day. 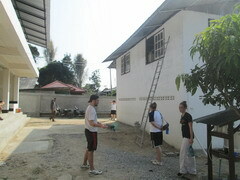 I told him that the west side of our first building had not been painted yet like other sides; this was because, while we were painting the building, there was an old wooden house next to the west side that made access and painting very inconvenient for us. 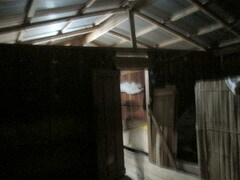 The old wooden house is gone now. 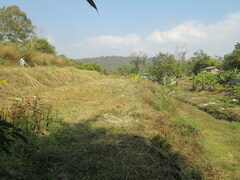 Then Kevin told me that he will ask those team members who are not cutting the grass at the Food Project to help paint this side of building. 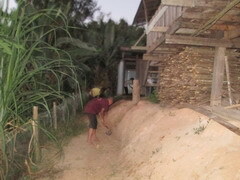 The previous landlord had grown Elephant Grass between each step of the rice terrace. 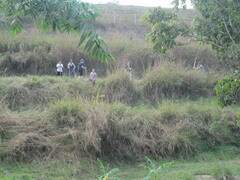 Now the Elephant Grass has grown quite tall, and we need to cut it shorter so it doesn’t overwhelm the Food Project and so we can easily access the area to work. 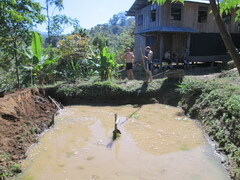 Though my brothers and sisters from YWAM Madison DTS are not used to this kind of work and the weather is quite hot, they worked on this project quite fast and did a great job. 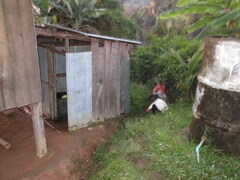 We feed the pigs at Omkoi with banana stalk and the left-over food from the hostel meals. 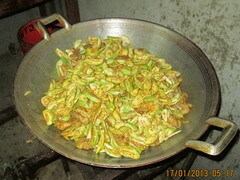 We don’t buy prepared food because we don’t want to waste money. 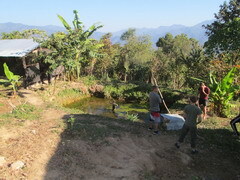 We need the pigs to help us dispose of the left-over food from the hostel, so it is not wasted and it is recycled. 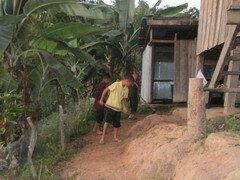 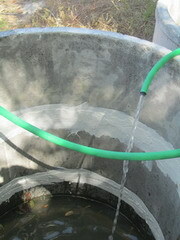 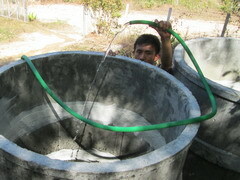 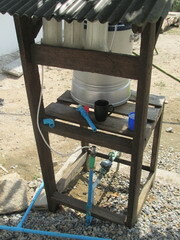 Since we have added a water filter to the water system, the children have very clean water to drink. 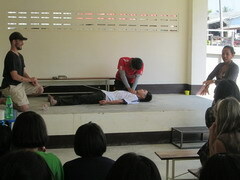 ทีมได้กลับมารับประทานอาหารกลางวันที่หอพักและพักผ่านเล็กน้อย หลังจากนั้น จอห์น รองหัวหน้าทีมก็นำคณะที่ยังไหวอยู่ไปลุยเจ้าหญ้ากับแฝกพวนนั้นต่อThe YMAM Team came back to have lunch at the hostel, and also to rest in the shade for about 1 hour. 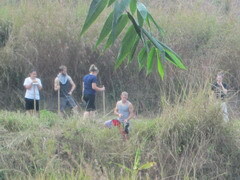 Then, John, the deputy chief, returned with those who wanted to continue to cut the tall, Elephant Grass. 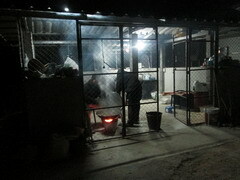 Since this team has many members, so there was one of the team asked me that ‘What should I do?’ I saw the rift of the floor behind the kitchen, so I him to fill up this rift. 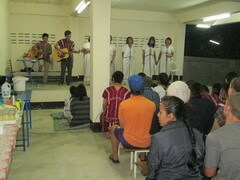 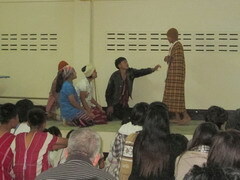 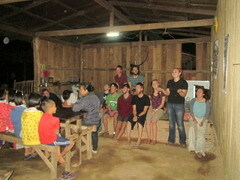 There was a skit and testimony from WYAM Madison DTS at the Metal Drum Student Home’s evening service. 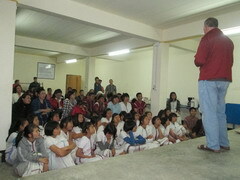 Actually, these brothers and sisters were very tired, but you could tell they had the love of God in them, and were keen to share the Gospel and explain the love of Jesus to the children. 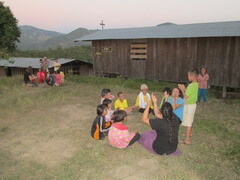 From their example, the children at the hostel can learn and take their teaching as an example and as way to share with others in their villages. 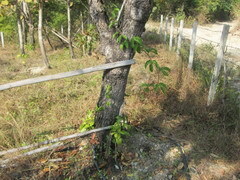 Our passion fruit tree has grown tall, so we need to tie its vines to the trees – this helps support them when they bear fruit. 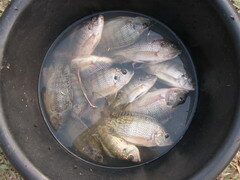 The boys wanted to go fishing, so we asked them to catch us fish for dinner. 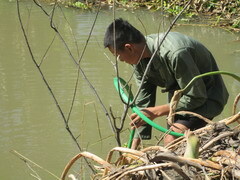 We learned that the fish in the small pond cannot grow as big as those in the big, deeper pond. 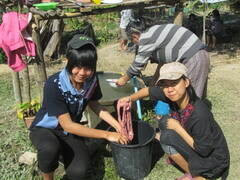 One day when we have time, we will make the small pond into a bigger fish pond. 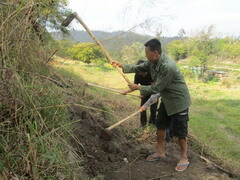 The soil here is sandy soil. 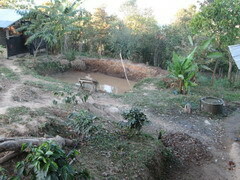 Many people told us that it is not good for agriculture or the crop will be dry and death, because the soil cannot hold the water. 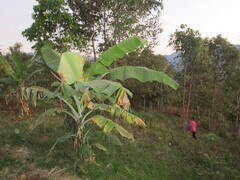 But in my opinion this is the a proposition that we have to solve, because even some desert countries can grow and export fruit. 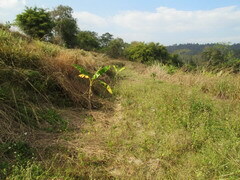 Just the sandy soil like this, God’s children must accomplish. 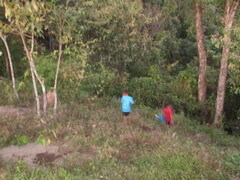 At the highest spot within our Food Project area, I asked the boys to make the ground flat so we can add water tanks in the future. 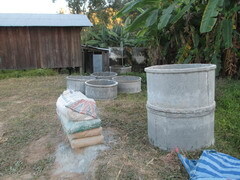 One day when we are ready, we would like to add more water supply tanks to irrigate the Food Project area that is next to the rice field. 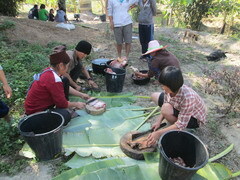 When Aunty Kara came and helped us at Omkoi hostel, she ordered 6 additional pigs for the Food Project; however, it became a burden to feed all of the pigs. 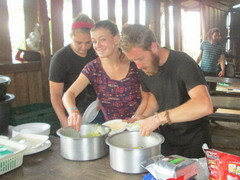 The left-over food from the hostel is only enough to feed 2 pigs. 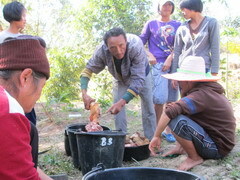 Today, we decreased the number of pigs to 2 pigs only. 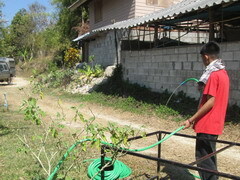 At one corner of Food Project area, we are experimenting pumping water with a DC motor. 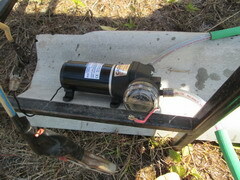 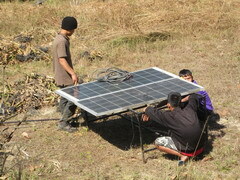 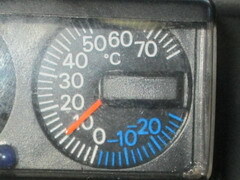 The DC motor can use the power from the solar panel. 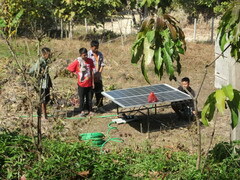 I called the boys to come and watch this experiment so that one day they may be able to replicate this in their own villages. 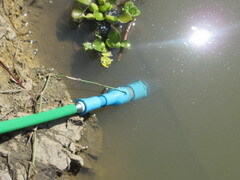 Last summer we discovered that water from the irrigation system dried up. 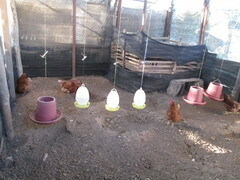 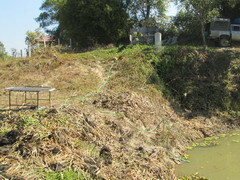 This is an alternative plan in case the irrigation water dries up again. 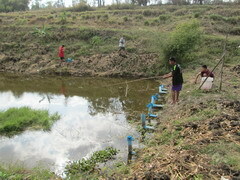 During the day, we plan to pump the water from fish pond up to water reserve tanks, which we placed at the highest point in Food Project area. 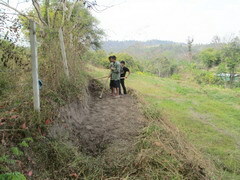 When we need the water for irrigation, we will just open the tap from the water reserve tanks and then the water will flow into the Food Project area. 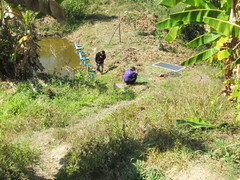 We experimented with the water system, pumping the water from another point in the Food Farm where the area is high and more distant; the result is that the pump is able to pump the water up to the point where we want to store the water. 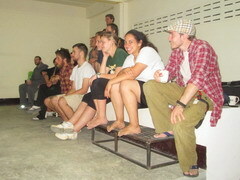 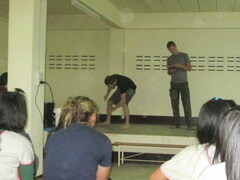 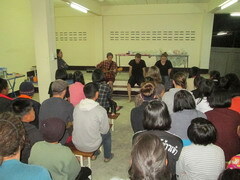 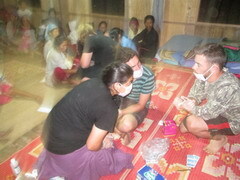 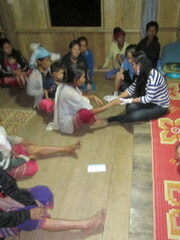 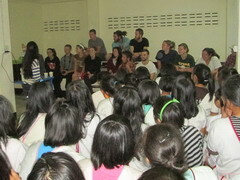 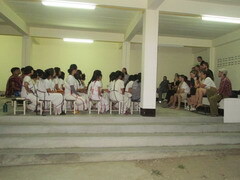 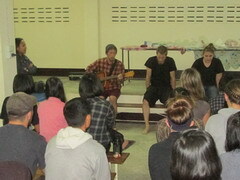 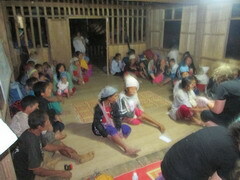 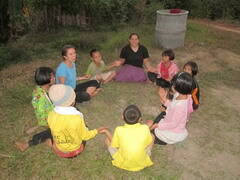 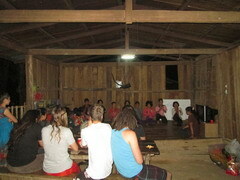 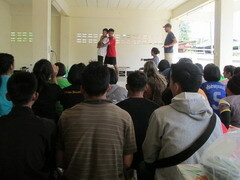 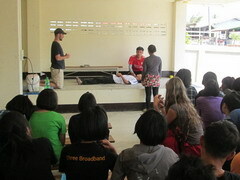 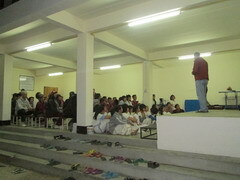 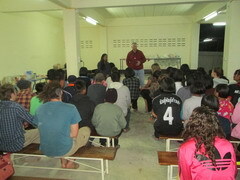 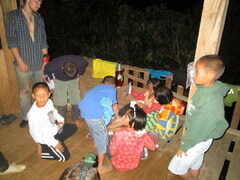 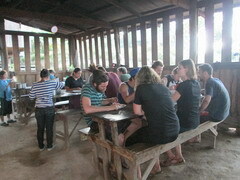 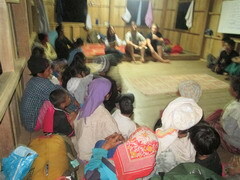 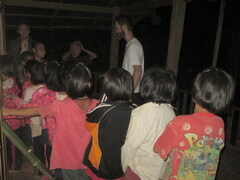 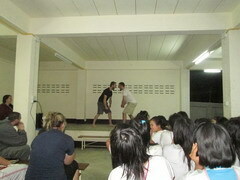 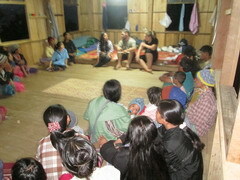 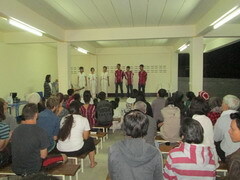 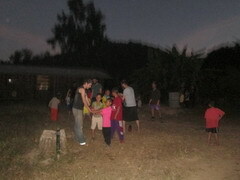 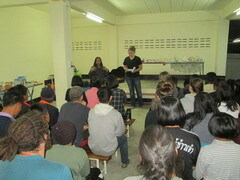 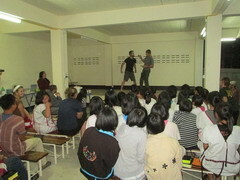 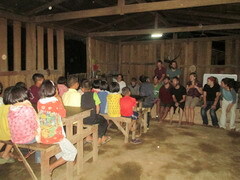 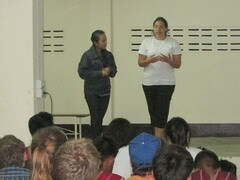 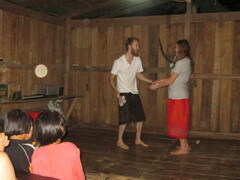 This evening the YWAM Madison DTS taught first aid to the hostel children. 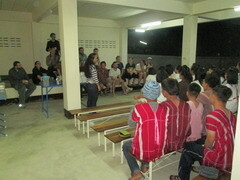 The evening service we gave time to YWAM Madison DTS to share the Gospel. 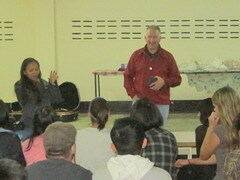 This evening, another guest, Pastor Jeff Prewitt from New Hope Church, gave the message to all of us. 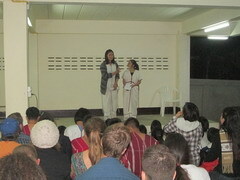 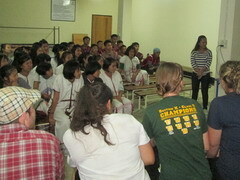 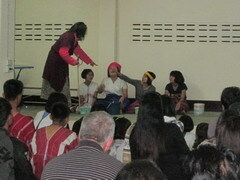 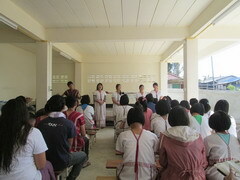 Miss Ou from the YWAM Bangkok ministry interpreted for the children, from English to Thai. 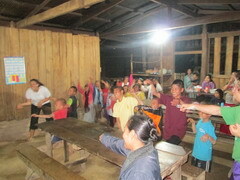 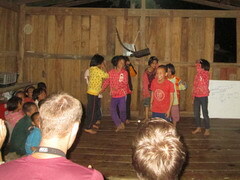 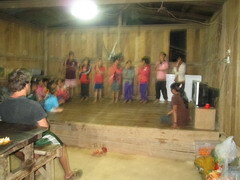 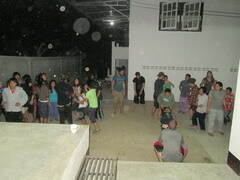 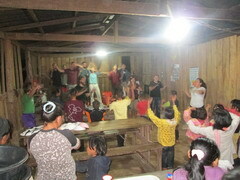 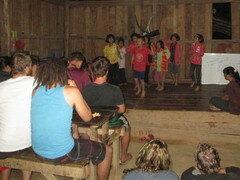 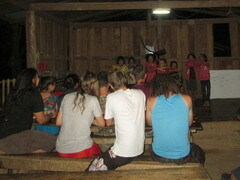 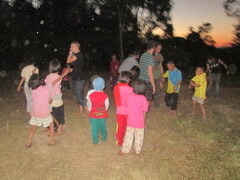 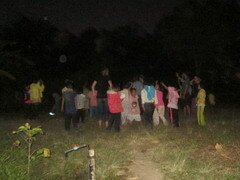 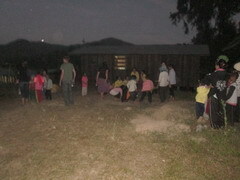 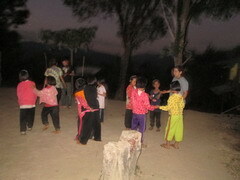 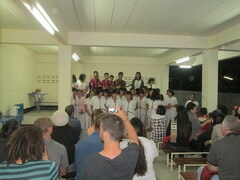 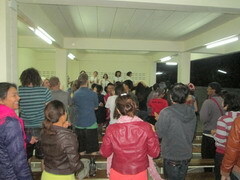 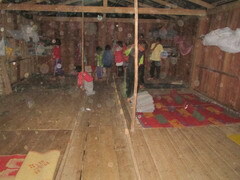 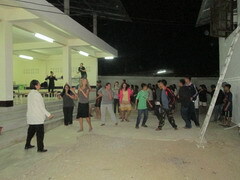 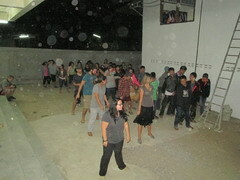 After evening service, the YWAM Team led the children in stretching by dancing. 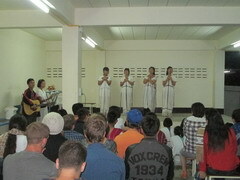 Today is Sunday – the multipurpose hall that brothers and sisters from Holland built for us is being used as the hostel’s church. 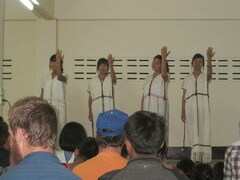 Most Karen Christians wear their ethnic clothes when joining the church service on Sunday. 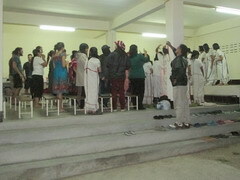 This is a good strategy by the elders in the Karen church, which helps to maintain traditional clothes being worn, and prevents culture from being eroded by globalization and change. 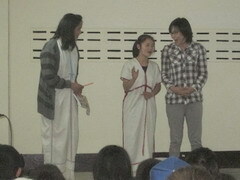 In the afternoon Mrs. Wotsawan Opartwisan from Bangkok came and visited us. 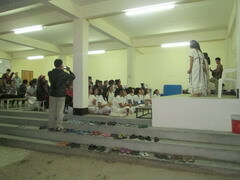 She is one of Team Jesus for our Student Home Ministries. 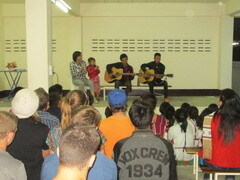 At this evening’s service, the children held a special program for guests, because there are three guests visiting us: the WYAM Madison DTS, Pastor Jeff, and Mrs. Wotsawan. 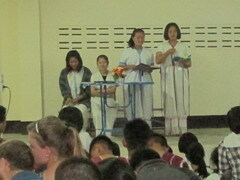 The service was concluded with a message from the Gospel by Pastor Jeff Prewitt. 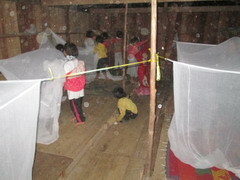 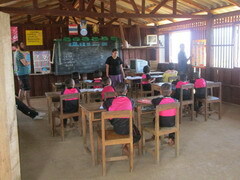 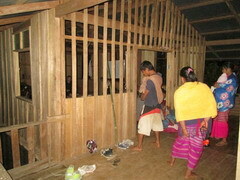 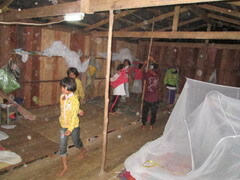 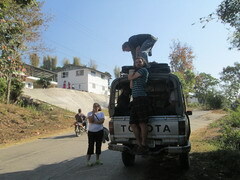 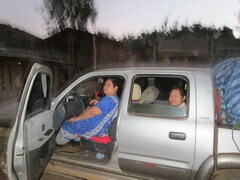 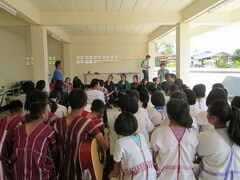 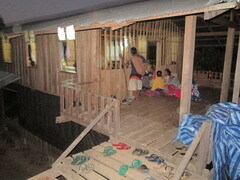 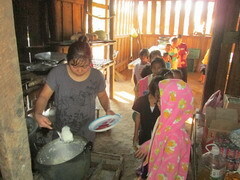 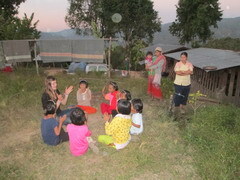 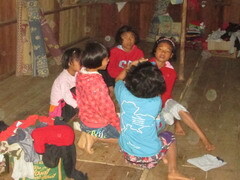 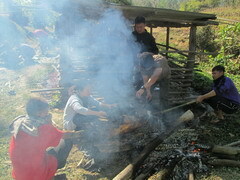 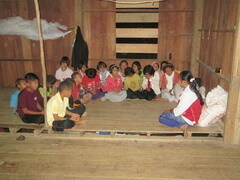 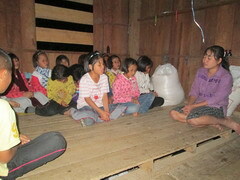 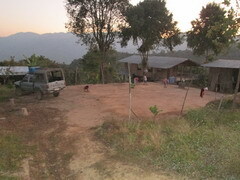 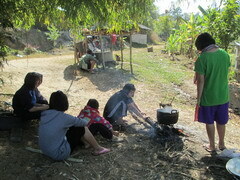 After the children left for school, the YWAM Team all departed for MawKlerKee village in Tak Province. 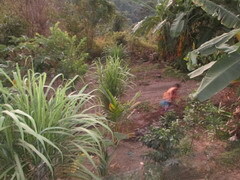 To get to MawKlerKee village by vehicle, it takes about four and 1/2 hours because it is a dirt road and is quite bumpy. 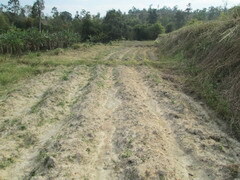 During rainy season this road become a very muddy road and makes it a difficult journey. 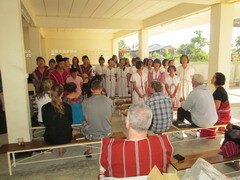 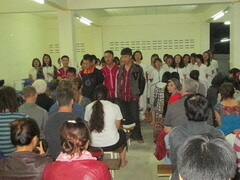 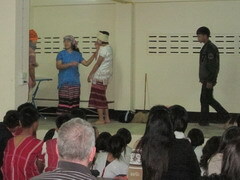 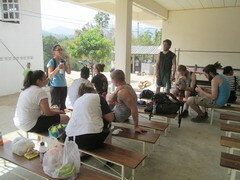 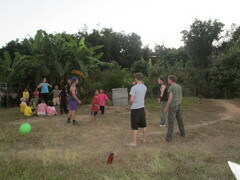 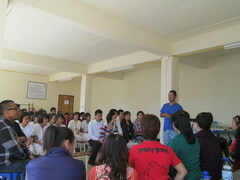 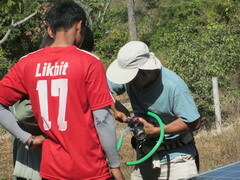 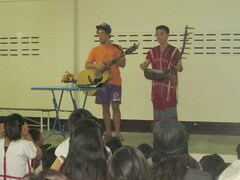 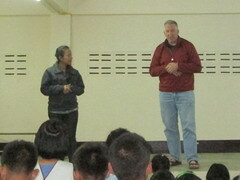 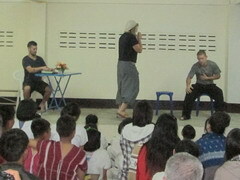 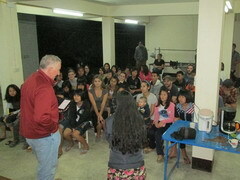 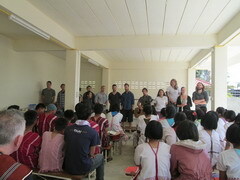 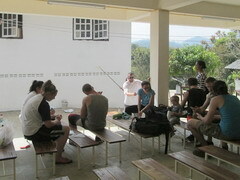 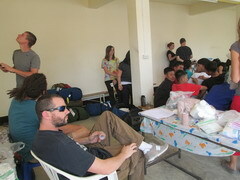 For the second part of journey, the YWAM Team was led by John Green because Kevin needed to return back to Chiang Mai. 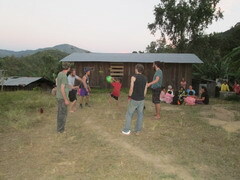 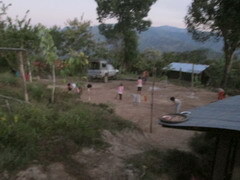 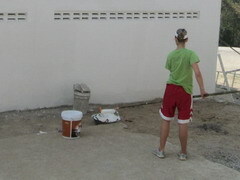 After dinner the YWAM Team started their activities that they had prepared for the children at the Metal Drum Student Home in MawKlerKee. 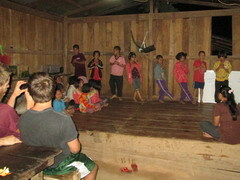 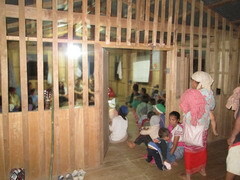 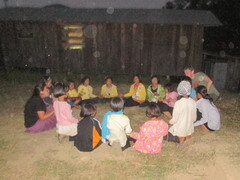 After all activities were finished, evangelist Tay Tay led the children in the daily evening devotion before the children went to sleep. 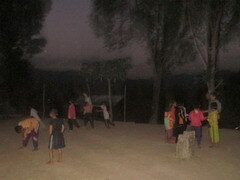 At 6:45 am, the children wake up, put their bedding in place, and have morning devotion; then, the children are given chores around the compound after they have had their breakfast, mostly it is to keep the hostel compound clean, and to water to the trees in the compound. 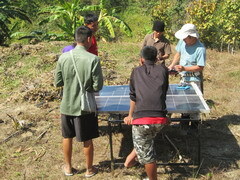 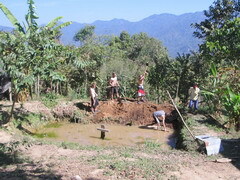 The YWAM Team divided into two work groups: the YWAM femaile team members went to teach the children at the government’s MawKlerKee school, and the YWAM male team members dig the fish pond at the hostel. 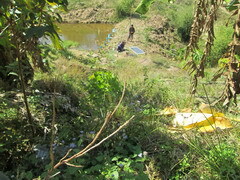 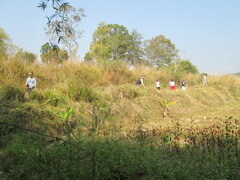 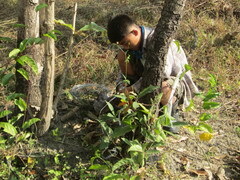 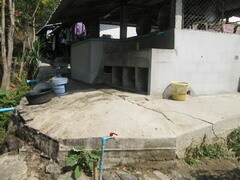 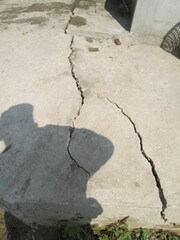 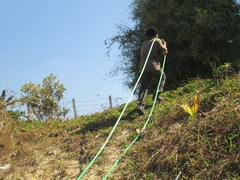 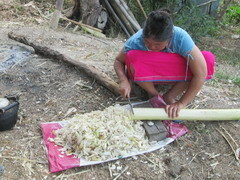 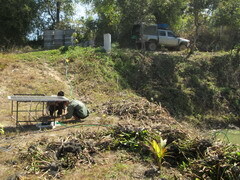 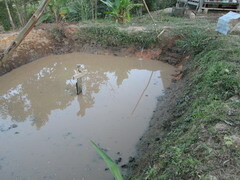 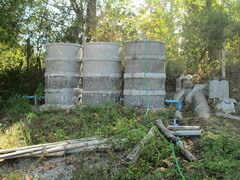 (the fish pond at MawKlerKee was dug by hand and not by machine, so the size of the pond is quite small). 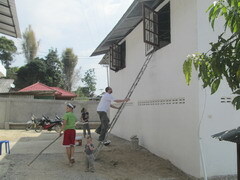 This work is heavy work, but John and his friends did great. 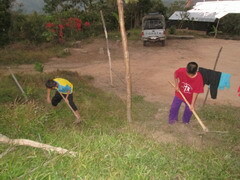 We know that at their home, they have never work hard like this and their work is to demonstrate the love of God in their hearts. 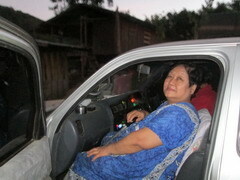 Today my mother surprised me because she came with my father to visit MawKlerKee. 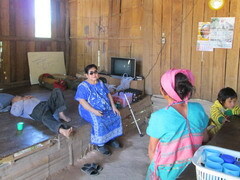 My father, Wright Dee, is visiting his evangelists who work in the mountains (between Tak’s side and across to KwaeKoh MaeTuen’s side, and MawKlerKee is on the way), so he came to visit and to rest at MawKlerKee for 3 hours before continuing his travels. 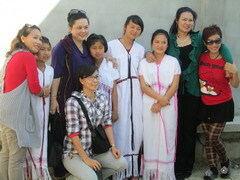 This is the first time my mother has visited the Metal Drum Student Home in MawKlerKee. 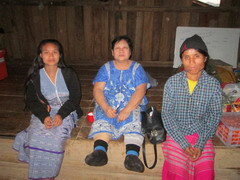 The villagers were very happy to see my mother, even though she only visited there in MawKlerKee for a few hours. 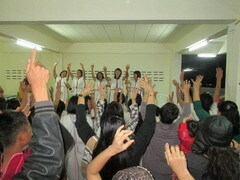 My mother always prays for me and this ministry. 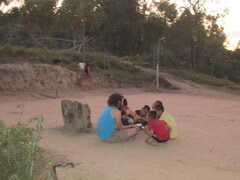 I am very grateful that my mother was able to come and see the work at MawKlerKee that she prays for continuously. 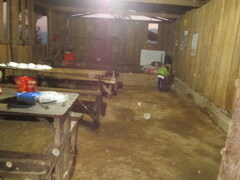 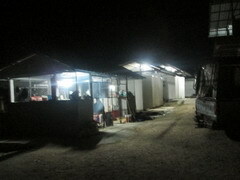 After my father stopped to visit us at MawKlerKee, he and my mother continued on to KwaeKoh village. 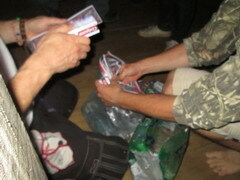 The YWAM Team also brought some basic medicine with them, so they provided some of this medicine to those villagers who were in need. 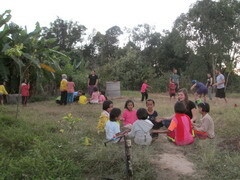 As for the YWAM Team, they continued to interact with the children; they must not feel tired and must really enjoy getting to know the children. 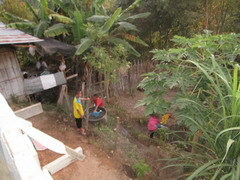 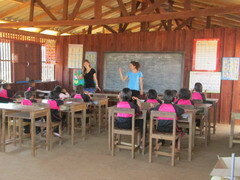 Today YWAM Madison DTS assigned duties for the day – just like yesterday, the first group is assigned to teach at the school, and the second group is assigned to help dig and expand the fish pond. 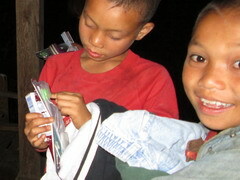 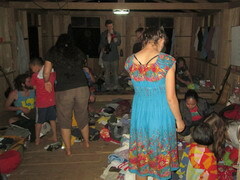 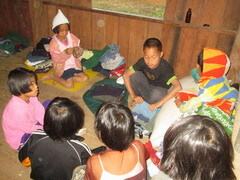 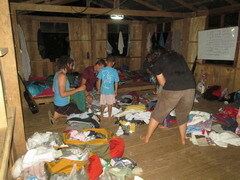 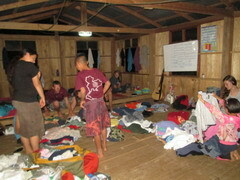 The YWAM Team provided gifts of clothes for the children and the villagers.